Matt Pitt speaking to the 41 members of the AMOL Chapter of the NHS. After Pitt spoke, each member was introduced and welcomed into the NHS. New inductees here standing with their lighted candles are (from left to right) Audrey Roden, Briar Reisz and Krystan Myer. Ashlyn Doiel (far left) lights her candle after being welcomed into the NHS. Next to her are fellow new inductees (left to right) Olivia Diggins and Morgan Clark. A small reception was held following the ceremony. Check out the treats and the cake! Pitt speaking to the 41 members of the AMOL Chapter of the NHS. 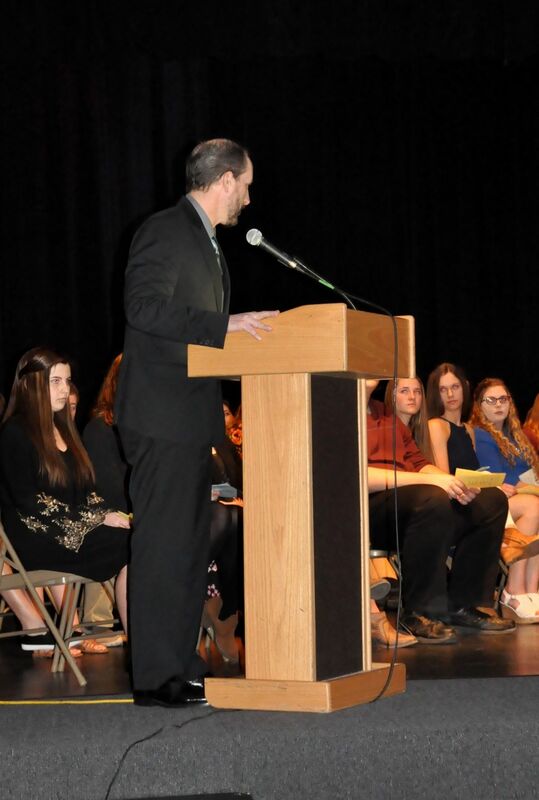 The guest speaker for the evening was Matt Pitt, the county Environmental Health, Planning & Zoning coordinator, spoke to the students commending them for their work to become part of the Society and encouraged them to continue working hard both inside and outside of the School walls. He also had a special message for the senior members. "Seniors, thank you for providing direction and guidance to those around you," Pitt said. "Thank you for representing the Logan-Magnolia Community School past, present and future." See full coverage of the event in the March 6 print issue of The Twiner-Herald.